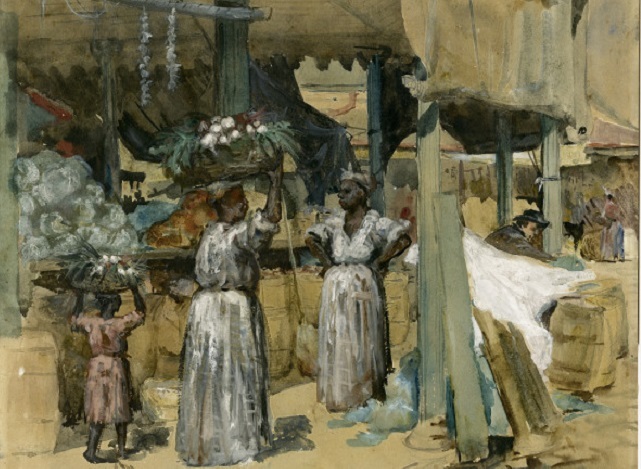 French Market scene, New Orleans, 1891. From a gouache and watercolor painting by American artist William Woodward (1859–1939). Image courtesy of WikiMedia Commons. Three years ago, Story of the Week presented the Kate Chopin story, “A Respectable Woman,” whose heroine is unsettled by her attraction to Gouvernail, her husband’s friend. Gouvernail appears again in the much longer, more complex story “Athénaïse,” and he fills a very similar role: the “sensitive bachelor” (to borrow author Joyce Dyer’s characterization) whose attentions to a married woman straddle the line between flirtatiousness and thoughtfulness. Athénaïse, the married woman of the story, is trapped—limited by the opportunities afforded to her by society. It’s no coincidence that the character shares the name of Chopin’s grandmother, Marie Anne Athénaïs Charleville, whose husband, a failed Virginia businessman, deserted her and their seven children, leaving them virtually penniless. Given this real-life background, the story takes on a “what if” aspect. The fictional Athénaïse, having escaped an unhappy residence in a convent, is equally “wretched” in marriage—and so she flees again. She is unable to articulate any legitimate complaint against her husband; her main objection to the marriage is the loss of independence: “things seemed all wrongly arranged in this world, and no one was permitted to be happy in his own way.” Her parents, however, hope that “marriage would bring the poise, the desirable pose, so glaringly lacking in Athénaïse’s character.” The editors of The Atlantic seemed to side with this latter view when they added the subtitle “A Story of Temperament,” thereby suggesting that Athénaïse’s rebellion is little more than a matter of individual willfulness and immaturity. Notes: The paths of the Cane and Red rivers have changed dramatically over the past two hundred years. Now part of the modern Red River, Rigolet de Bon Dieu was one of the meandering waterways in Louisiana’s Natchitoches Parish. (“Rigolet” means literally “little rapids.”) On page 354, the song Juanita refers to a love song subtitled “A Spanish Ballad” and published in 1855. The Duchess (p. 375) was Margaret Wolfe Hungerford, an Irish writer of romantic fiction, whose novel Molly Bawn (1878) contains the first known appearance in its present form of the English expression “Beauty is in the eye of the beholder.” Frederic Remington (1861–1909) was a famous painter of cowboys and Western scenes. Tiens! tu vas les garder comme tu as jadis fait. Je ne veux plus de ce train là, moi! – There! You’ll keep them the way you used to. I don’t want to do this anymore! Other expressions and sentences will be clear from context. Athénaïse went away in the morning to make a visit to her parents, ten miles back on rigolet de Bon Dieu. She did not return in the evening, and Cazeau, her husband, fretted not a little. . . . If you don't see the full selection below, click here (PDF) or click here (Google Docs) to read it—free! Beautiful ~ Thank you so much for sharing this!